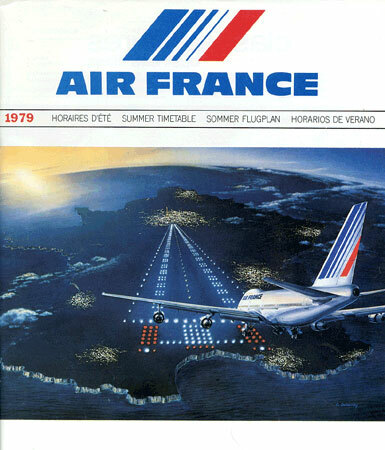 Intended for distribution in France outside of Paris, this quick reference timetable for France includes all additional Air France schedules in a flight itinerary section late in the timetable. This edition could be considered a class 2A issue. Includes all US schedules and abridged schedules for other markets. Pocket size with schedules presented in hybrid quick reference and columnar format. Also includes other USA-PAR services. Also includes Trans South Atlantic and most international European services. Issue evolves to probably include all service to/from Europe but excludes local African services. Very nearly a 1B issue. Regional timetable for Italy in quick reference format. USA timetable for Transatlantic services to/from Paris. STO/GOT><PAR in pocket, columnar format. STO/GOT><PAR on inside cover. Full PAR schedules presented in standard AF quick reference format. "Representation France Ouest et Sud-Ouest"
Highlighting Paris connections and intended for the Spanish market, this timetable is essentially a local timetable for flights to/from Paris.